Wow. 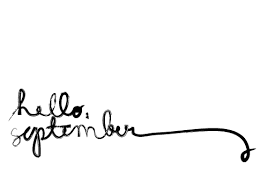 September is here. Man! But I can't wait for XL sweaters, fuzzy boots, sweats and the colors. Ah... and I'm going to make some goals for this September! Happy Happy! Check out my goals for August. "Make 20 new friends"- Oh my grapefruit! We are so close but the happy side 19 friends! Wow! *cheesy speech* Who know I was so so awesome? Thank you for following me! I never thought that I was going to get at this spot! THANK YOU! *Party with pizza! * Kidding. "Find 10 blogs and follow"- Well that was TOO EASY! I found like 30! I love meeting new bloggers and friends AND blogs! I love reading what other people have to say. "Enter a contest"- I feel pretty proud. I enter Jollygirl writing contest for her 15 followers (I think). I didn't win but all my congrats to the winners! "Do 5 guest posts"- Well um didn't FIVE but I did one. I was so busy on my blog that I didn't have time! This "guest post thing" is still pretty new for me. So ya. "Try some crafts" So for crafts and diys. I found some great crafts. But I gave my own roll with it. A lot All of the crafts that I did was room-crafts. "Watch TFIOS" Sorry but did not happen! I fell in love with Divergent. Ah. I CAN'T WAIT FOR THE 2th BOOK! Someone help me. "Sew something"- I practice some sewing but not a lot. My Grandma is going to help me tomorrow. Yay! "Sell cupcakes"- But NO. Period. "Have a party or play-date"- Play-date with my awesome cousins. 5th graders this year! Yay! Okay now that I have this done time to tell my goals for September! Last see my old friends again. Does anyone have "Fancy" stuck in your head! It is nice that you have full filled so many goals. Also, the second and third book to divergent are out so you do not have to wait. Same here! I going to wear my boots too! I like this blog! It's sweet, and cheerful, and gives me something to do while I procrastinate! I have summer reading stuff to do, which I guess I better do right now. Tata for the moment!